It's no surprise that when opposites attract great things happen. Which is why I'm super excited for spring which is sure to be filled with neons and pastels. I tend to lean to cleaner, classic colors and silhouettes, but this season I'm excited to liven things up with a pop of color here and there. Gorgeous and PS, obsessed with your new design over here...exactly what I'm going for when I re-design mine- gorgeous!!! this is an awesome post!! I want both! I actually want everything in this post! i want everyone of those polishes!! I absolutely love the pastels going on right now, but brights and neons make my heart pitter patter! 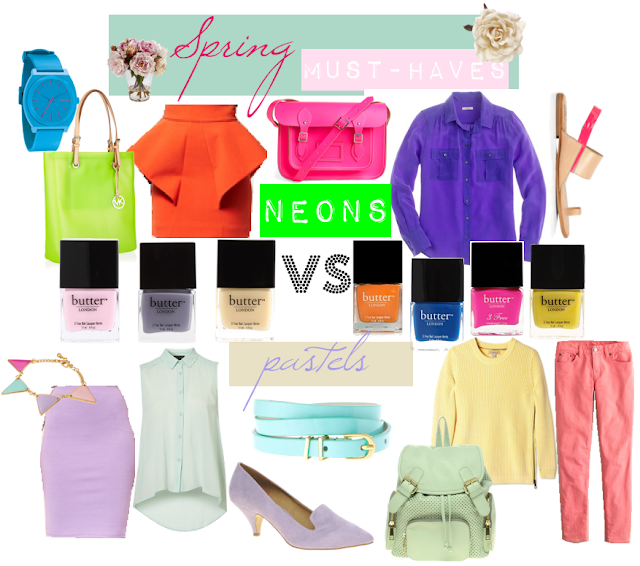 I can not wait to wear some brights and neons! That peplum skirt is fabulous! so fun to see the two color ways together! I don't wear a lot of color but I'm so excited for both neon and pastels!